A nice cross sell. These casual shoes were marketed via Tubular Slatwall Faceout among the Apparel. A great way to suggest a complete style statement while you are making the clothing sale. But drats! 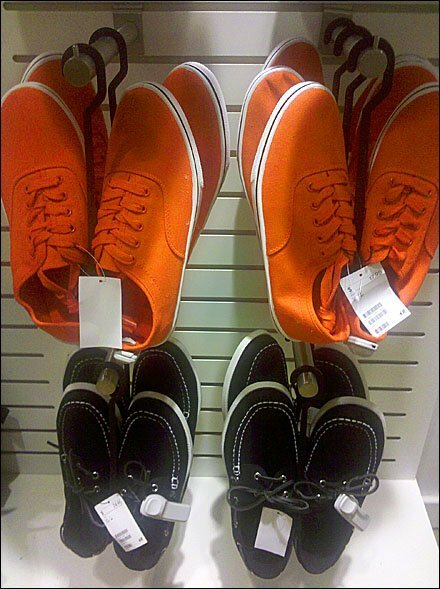 I should have checked for an echo of Apparel in the Shoe Department. Also it is the fixture that helps hang the shoes from the Faceout that is most curious. Both thoughts only occurred to me later as I wrote the post. Reciprocity should be required among departments. As for the shoe hanger, I’ll have to go back for a second look.